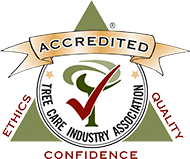 Established in 1938 as the National Arborist Association, today's Tree Care Industry Association (TCIA) is a trade association of more than 2,200 commercial tree care firms and affiliated companies. TCIA develops safety and education programs, standards of tree care practice, and management information for arboriculture firms around the world. Produced by arborists, for arborists, and tested in the field, you can be confident that all training material is relevant and applicable. 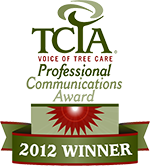 CS Tree Services, Inc. was awarded a Professional Communications Award from the Tree Care Industry Association (TCIA). More than 20 years old, this program honors marketing and communication excellence within the tree care industry. The CTSP program allows one or more key employees at a given company to become certified tree care safety experts, thereby empowering and encouraging a culture of safety within that organization and across the industry as a whole. Maintaining a Certified Tree Care Safety Professional on staff means that this organization is committed to safe practices in arboricultural operations. CTSP’s are kept abreast of the latest technological advances and regulatory activities affecting the industry through the TCIA safety network, and must commit to ongoing education in the safety field in order to maintain their certification. Because safety regulations and industry standards are continually evolving, the ongoing education requirement is vital to maintaining a legitimate safety program within a given company. CS Tree Services is a screened and approved Angie's List member. We are a multiple-time recipient of the prestigious Angie’s List Super Service Award, an honor bestowed annually on approximately 5 percent of all the companies rated on the nation’s leading provider of consumer reviews on local service companies. Licensing is required for commercial applicators applying any type of pesticide for compensation, public operators working for a state or local government who apply pesticides in their course of work, dealers selling restricted use pesticides, or pest control consultants making recommendations for pesticide treatment of pest problems. CS Tree Services has generous General Liability and Workman’s Compensation policies of $2,000,000 and $1,000,000 respectively. We also have an additional umbrella policy for expenses over those limits. These policies protect our customers and employees. A copy of our insurance certificate is sent with each estimate we provide.